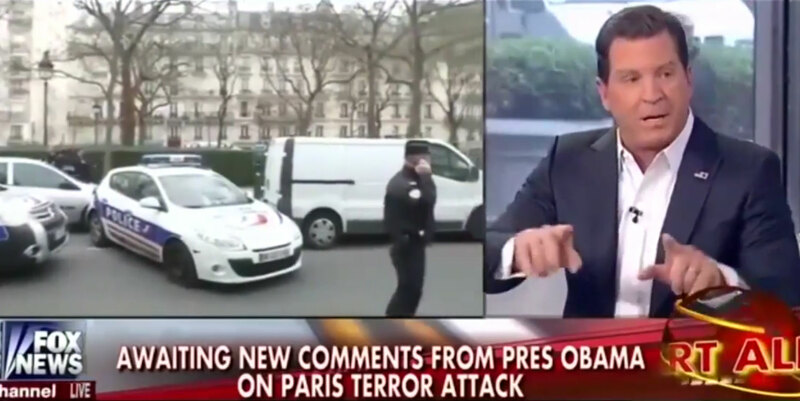 In the wake of the Paris attacks, moral idiots play their predictable roles. Just as the politicians and activists immediately deployed the murders in their rhetorical tool kits, so too did our pundits explain that the killing demonstrated what each had been saying in the first place. Naturally, Fox led the pack: The Five host Eric Bolling equated both campus political correctness and Bill de Blasio’s attempts to end racial profiling in the NYPD with these acts of mass murder. Another lunatic Fox analyst, Tom McInerney, insisted that de Blasio, New York’s “communist mayor,” was asking for the same thing to happen here. Barack Obama and Hillary Clinton were also among the culprits held responsible for the attack: the former is too “soft on radical Islam” (Fox analyst Ralph Peters), while the latter “wants you to empathize” with the killers (Fox contributor Richard Grenell). Hardly less bizarre was the fact that among the most simple and sensible comments one could find in the aftermath of the attack came from two conservative pundits, The New York Times’s David Brooks and Ross Douthat. The former noted that “The massacre at Charlie Hebdo should be an occasion to end speech codes. And it should remind us to be legally tolerant toward offensive voices, even as we are socially discriminating.” The latter added, “The right to blaspheme (and otherwise give offense) is essential to the liberal order,” with the qualifier that “There is no duty to blaspheme, a society’s liberty is not proportional to the quantity of blasphemy it produces, and under many circumstances the choice to give offense (religious and otherwise) can be reasonably criticized as pointlessly antagonizing, needlessly cruel, or simply stupid.” In a rational political discourse, these points would not even need to be said, much less celebrated. How one responds to this daunting challenge is obviously a matter of debate—a debate that we appear to be incapable of carrying out. It ought to be obvious to any sentient being that jihadi terrorists are a minority in the Muslim world. This fact could hardly be better symbolized than by Lassana Bathily, the Malian Muslim who worked in the stockroom of the supermarket that was attacked and risked his life to save the Jewish shoppers. “They congratulated me,” Bathily reportedly said. “They told me ‘Thank you, really.’ I said, ‘It’s nothing. That’s life.’” Perhaps, but it’s more than our discourse can handle. Editor’s Note: This article originally said Greta Berlin “wrote on her Facebook page” that “‘MOSSAD [the Israeli intelligence agency] just hit the Paris office of Charlie Hebdo in a clumsy false flag…'” Berlin actually re-posted the comment from an acquaintance. The article has been updated to reflect that.